Here’s the list of baby fairs in Malaysia (Kuala Lumpur) for 2015. It’ll be updated as more information streams in. P.S. 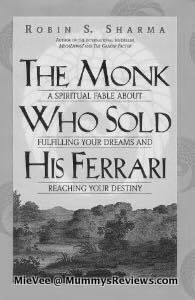 : List updated on 1 January 2015. This list is subject to change. Changes may not necessarily be reflected on this list. Please verify with information from the organiser / venue website. 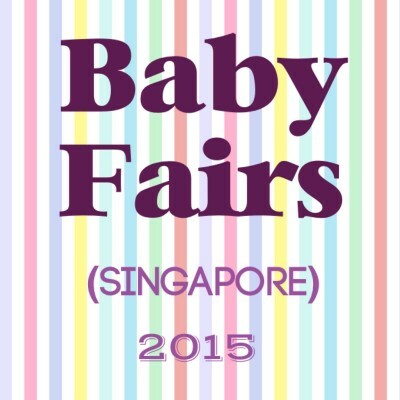 Here’s the list of baby fairs in Singapore for Year 2015. It’ll be updated as more information streams in. Time: (Fri & Sat) 11a.m. to 9p.m., (Sun) 11a.m. to 8p.m. Note: List updated on 8 October 2015. This list is subject to change. Changes may not necessarily be reflected on this list. Please verify with information from the organiser / venue website. 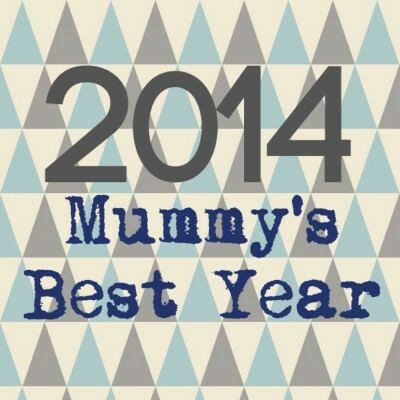 – being mum to 3 kids all year round. Survived the night feedings, diapering, teething, carrying and everything else that come with a baby. Mission accomplished; goal of 3 kids met. I was elated when little El finally turned 1-year old in Oct! 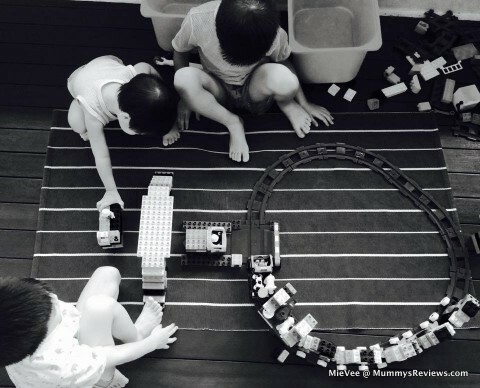 – moved our home & homeschool. I single-handedly packed 20+ boxes of books and learning materials. And my oldest kid was only 5!?! 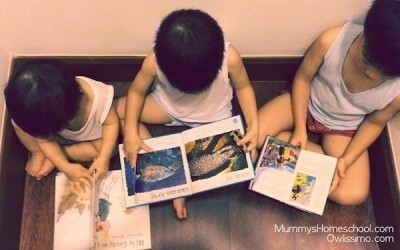 Made me realise how “serious” our homeschool is and I hope not to move again for at least 5 years. – started my new business at Owlissimo*. FOUR days before moving house. Crazy, right? I’d conceptualised this for a while but kept putting it on hold. 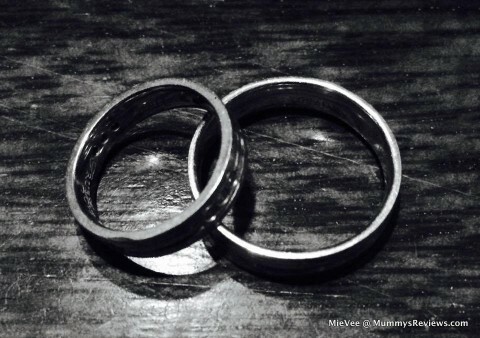 Hubby finally gave me a hard nudge and bang… It happened. This meant working for a few hours each night while the kids slept. – ran 7 sessions of Home Practice Intensive Workshops*. Shared how to blend right brain and Montessori methods with about 180 parents. Response was so overwhelming that I’d to run 2 sessions on consecutive days in November. There’re even requests for me to travel further or conduct private training sessions. A big thank you to my friends and readers for your huge support. Depending on which country we were in, each session required a combination of hubby / my parents / our domestic helper to care for the kids while I was away for about 4 hours. As a full-time mummy, these sessions are completely off-routine and I’m thankful for all the help received. As little El grows older, there should be less carrying and better sleep. I look forward to an even better year ahead, at home and at work. May your 2015 be fantastic too! We usually don’t shop much when lugging the 3 little ones out. But this week, I’m updating our homeschool furniture, so a long trip to IKEA over the weekend was inevitable. Mega headache. #3 El (1yo): by default, he is back-carried using our beloved Boba Carrier (reviewed here). After some walking, he dozed off. Great, one down. Vee (5.5 yo) and Jae (3yo) are the challenging ones. No one agrees to sit on the stroller for long. We’ve our second beloved item — Peg Perego Pliko P3 stroller — on which one sits while the other stands on the small buggy board. We decided that Jae was to sit first. Of course, he protested. Upon hearing that I’d be buying the deep fried salmon balls as snacks, he cooperated. So I bought some peace with RM4.50. Vee was getting bored and whiny during his turn to sit in the stroller. Jae had brought along a toy car to entertain himself while Vee didn’t have anything to do. Obviously, he wasn’t interested in looking around. I quickly grabbed a survey form that sat above the paper measuring tapes. Oh yes, and a pencil too. Hubby kept his eyes out for the items on our shopping list (love the IKEA app!) while I explained each item on the survey form to Vee. He must be having a darn lousy time because he marked “poor” for nearly all the items. Interestingly, he rated “Excellent” for “Restaurant” even though we just sat down at the table. Just then, a girl about 6 years old ran frantically past our table and cried for her family. There were loads of shoppers during the lunch peak. A group of diners asked her to stay put while hubby went to get the security guard. Even before help arrived, the girl’s family found her. Lucky girl. Vee and Jae witnessed the entire episode and understood the importance of staying close to us at crowded places. A true case is worth more than a thousand nagging words. At 3p.m., we finally ended our 3.5-hour high-tension shopping trip at IKEA. I’m glad we aren’t going to repeat such a long shopping trip anytime soon. Super looking forward to the furniture being installed on Christmas Eve. Merry Christmas to you and your loved ones and have the best year ever in 2015! For the first time ever, I found the courage to bring all three boys out to a dear friend’s house. Usually, I’d venture out with my entire “brood” only when hubby is around. – going to a place with new toys keeps them entertained for a long time. Basically, they played with toy cars and a garage with slide for 2 hours while I chatted in complete peace!!! I’m so thankful to my friend for having us over. As little El becomes more independent, we’d probably have a lot more outdoor fun. 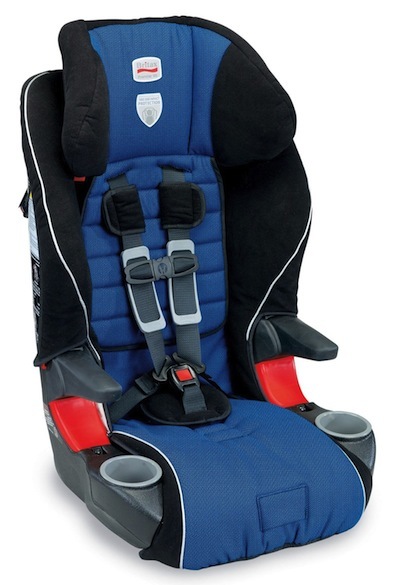 Britax Frontier 85 is a combination booster car seat, meaning it can be used in harness mode for a younger child and seat-belt mode for an older child. Although Vee is rather big and sturdy for his age, at 20+kg, he’s still very light compared to an adult. As mentioned in IIHS website, “…they should use boosters until adult belts fit properly, usually when a child reaches 4 feet 9 inches and 80 pounds” . That’s about 145cm and 36kg. (a) Safety: ★★★★★ I like the 5-point harness and true side impact protection. 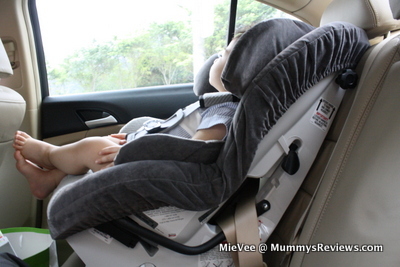 (b) Ease of Use: ★★★★★ Hubby was able to fit the car seat rather easily. Adjusting the shoulder strap to fit snugly is also easy. 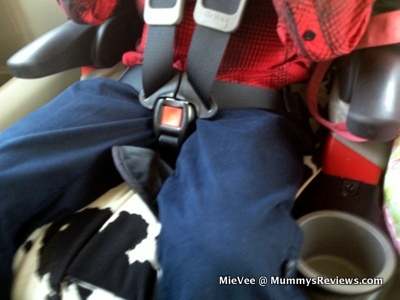 5-year old Vee is able to climb in and buckle himself up independently. This is especially important since we go out with 3 young kids. That sai, Vee is still too young to use it in booster mode, so we haven’t tried it out yet. (c) Fit: ★★★★★ It has fitted Vee from 4 years old to 5 years 9 months old now. It still has lots of room to grow, for use in booster mode. (d) Comfort: ★★★★ The fabric is soft, but not as luxurious as Boulevard CS. Vee naps easily in this seat, but his head may tend to droop forward. The arm rests and cup-holders are nice extras. With my boys, the cup-holders naturally become a trashcan for all kinds of junk — tissue paper, toy aeroplanes, bread crumps, just name it. (e) Quality: ★★★★ So far so good after 1 year 9 months. Still need to withstand a longer test of time. (f) Overall Value: ★★★★ The retail price was about RM1600. Again, though a bit on the high side, it’s definitely a great investment in our children’s safety. I feel very at ease when Vee is buckled up in it. We bought our Britax Frontier 85 from the distributor in Malaysia: Jingle Box. Disclosure: I purchased the Britax Frontier 85 at a discount from Jingle Box. To ensure a fair review, Jingle Box received 3 months of free sidebar banner ad in return. 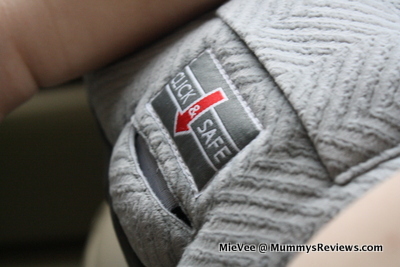 Here’s a review of our trusted car seat Britax Boulevard CS, purchased 4 years ago. 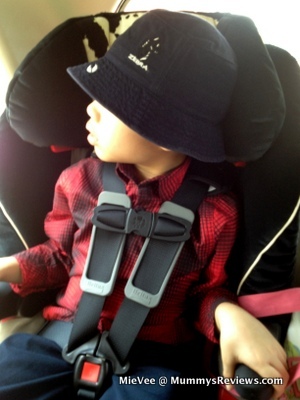 Jae is our second child to use it, and it’s still luxurious and provides solid support. In our family, using a car seat is compulsory. From their infant days, each boy has been placed into a rear-facing infant car seat. I try to let them face backwards for as long as possible until their legs have insufficient place to stretch, or when they hate facing backwards and fuss throughout the trips. This is usually about 1+ year old, though ideally I’d prefer to let them face backwards for even longer. Since we drive between Singapore and Kuala Lumpur several times a year, it’s important for the boys to get used to sitting (and hopefully sleeping) in their car seats for at least 1-2 hours until we take a break. So we’re consistent in ensuring they’re buckled in their seats before moving off, and I arm myself with a bag of toys and activities during their babyhood days. Of course, life isn’t always a bed of roses. 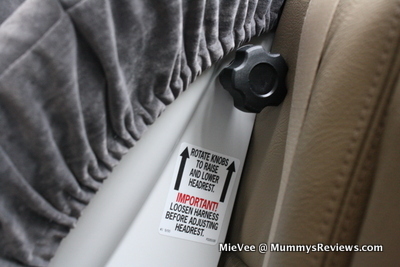 There have been incidents when the baby is extremely fussy and unable to fall asleep in the car seat, so I’ve to nurse him or let him fall asleep in the baby carrier first before trying to transfer him into the car seat. I’m always thankful when these difficult episodes are over and we’ve travelled safely. Coincidentally, when the boys turned 1.5 years old, they’re able to fall asleep easily in the seat or sit peacefully for long stretches simply watching the outside scenery. Phew! “BRITAX has been a leader in mobile safety for more than 70 years, with a legacy of leadership in developing innovations that enhance the safety of child car seats and improve their ease of installation and use. Our uncompromising focus has made BRITAX the best-selling child car seat in Europe and one of the brands most trusted by American parents and caregivers since entering the U.S. market in 1996. 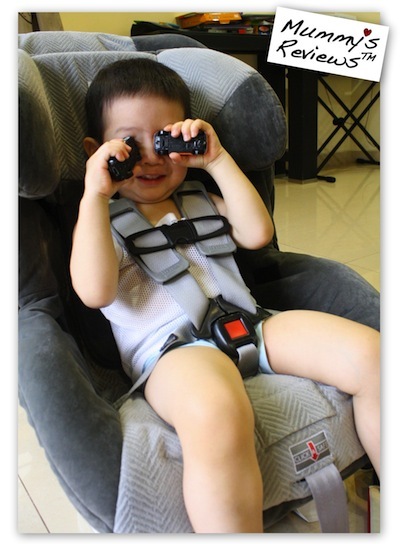 Our commitment to improving child safety is unparalleled, as evidenced by the fact that our products undergo the most rigorous testing in our industry at five BRITAX testing facilities worldwide. We also work closely with vehicle manufacturers to encourage design improvements that enhance the performance of child car seats. When shopping for the toddler car seat, my priority was a 5-point harness. I’ve read about the high quality of Britax car seats, so it was rather easy to zoom down onto Britax Boulevard CS in the store we were at. There were only 2 units left– we took the grey. The fabric felt soooo luxurious! 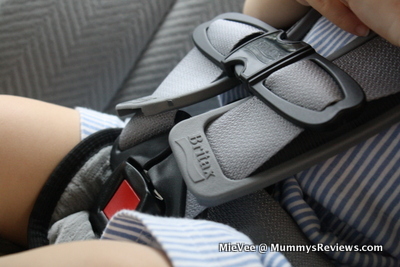 (b) Ease of Use: ★★★★ A rather long seat belt is needed to fix the car seat. When we had to replace our car, we shopped for one that could accommodate this car seat. (c) Fit: ★★★★★ It fitted Vee from 1+ to 4 years old. Jae just turned 3 and is still using it. (d) Comfort: ★★★★★ The fabric is soft and luxurious, like a cuddly teddy bear. The older boys nap well in this seat, and i like to rest against it. (e) Quality: ★★★★★ The quality is excellent. After 4 years, it’s still in great condition, ready to be used with #3 El when he grows into it. (f) Overall Value: ★★★★ The retail price 4 years ago was RM1999. We bought it at 20% member discount, that’s about RM1600. Though a bit on the high side, it’s definitely a great investment in our children’s safety. I feel very at ease when Jae is buckled up in it, and that is priceless. We bought our Britax Boulevard CS at The First Few Years (parallel import). The Britax distributor in Malaysia is Jingle Box. 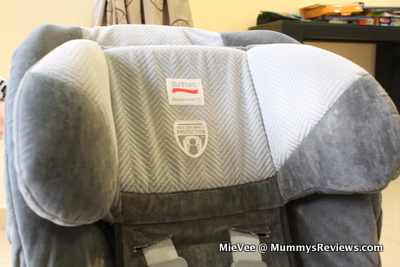 Sharing time: What are your favourite car seats? Do share in the comments section or link up to your review post. 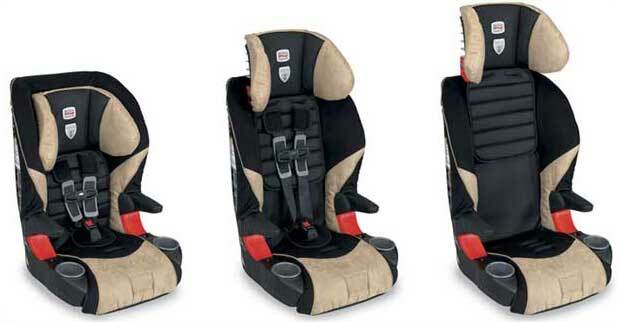 Disclosure: We bought our own Britax Boulevard CS car seat.